Actually, that's the fun part... a slider and a slideshow aren't actually that far apart. Some presentation differences but conceptually much the same thing. hey Captain lighten me up here for a moment i was thinking does this LevGal have a feature for boarders or to have frames placed around the images. Cause i was thinking it would be great if someone had a forum, say about wedding ideas and added this to there photos album when they uploaded it. I'd reckon it would look fantastic. Even putting it around the slider. The woman go crazy for this sort of thing, i mean the brides to be that is. I do not like sliders myself; it is just another means of cluttering up a single page IMHO. A slideshow on the other hand might be nice to have, on a per gallery basis. BTTT - for image hosting, Flickr and SmugMug seem to be the best. I have had problems with ImageShack & PhotoBucket deleting 'old' files. BTW I'm really liking the mod so far; the preview mode option for forum posts is awesome ! Thanks. I'm still not sure I see a difference between a slider and a slideshow. Or at least... what everyone else seems to see as the difference. To me they're two different words that mean basically the same thing. Or am I missing something fundamental? Captain have you read my post above with regards in adding a boarder around the images or including a slider with boarders or frames enclosed. Can it be done to make it more appealing. I think difference is in the coding and most slide shows use the java thing, and the Flash, the size also and the slideshow can managed and controlled by the guest or members as well as the admin. For example the user can click on a given set of images and click "slide show", and it will fetch those pictures will start to scroll across the window, leaving the gallery in the back ground. ( I'm not saying this can not be done with the slider, never seen one that works this way) like programed by the user. Most sliders use JQuery and or CSS3 and HTML, now days and have only a set number of slide that are displayed and they usually larger, used only for intro pages of the site. The side in most case loops the same images! and if use to much they are annoying and distracting start up on their own( I would use this just show screen of the products or service you offer). If you do a slide show I would try to make it a plug-in! 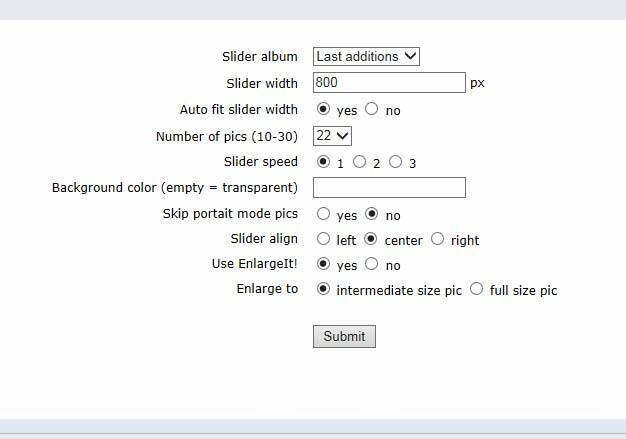 ( because there will be some coding to consider for it admin management and user controls.. and it can also do select amount of random image and thumbs! Coppermine has a nice slideshow, but the coding probably very old, but looks nice and Lurk has this on this site! But you are correct in the they both slide images! Maxx, I have a very basic marquee type slider at the top of my gallery page, this is coupled to a enlargeIt plugin I have installed. And the gallery also has two slideshow options. 2: The standard (built in) Coppermine one. If you click a thumbnail to view a image you'll see at the top of the image a slideshow button, this will grab all the images from that album, and present as slideshow. Yes. This doesn't ask, or imply an answer to, the subsequent question of "will I do it" to which the answer is... I'm not sure. Probably not unless others are more interested in it because there are some issues that need taking into account for my market. So as far as slideshow vs slider is concerned, are we concluding then that 'slideshow' is a one page deal that is dedicated to switching between media items, while a 'slider' is a block on another page, e.g. the front page, where we automatically show multiple images switching but in all practical respects it is not the dominant force on the page? As far as the frame. that real old news, and not used any longer and too complicate to do on an interact gallery package. Even the borders are not used that much any longer except when magnifying a Picture. ( i would not recommend getting in to that)! The border radius is or maybe a good thing they good if less than 8 or pixels! My feelings only! On the slide show if you saw Lurks site, saw the slide show at the top, and if you click on someone's folder and open an image, I think there is a place to click the folder's slide show, show them bigger and one at a time, but will go through them all. The slide I'd forget about that, as not part of the gallery! Now the could possibly be used on TP or other portal upper panel or Global headers footer type thing, but these image in order to big have to be set off line, then up loaded to see if they fit well, You can change the images however they must be of the same size and put into the same folder and you may add more images if you like same goes as far as setting it up. as you can see on all page it/s get redundant and some what annoying. Now if done right the slider will be responsive and various effects available! So in short for the site home page may work well, on every page not so good. Note you may be able to Incorporated this inside the Gallery, but this you line not mine coding this in. This one can be done in all sizes and the thumbs displayed on mouse over at the bottom. no java no flash , only a Jquery for IE! I simply use http://picuploaders.com no hassle. There’s no requirement to register as users can anonymously upload photos.